As the pixilated Deborah, Ms. Bessette grabs the spotlight instantly, without saying a word. Facing the audience abed with her torso upright, her gaze is blank yet aglow, a neat trick for any actor, and a captivating effect for the onlooker. She and we soon learn, from avuncular Dr. Hornby (Michael Bryan French), who dispenses revelations in small doses, that Deborah has been afflicted for 29 years by a bizarre disorder akin to being continuously asleep. Embalmed in the persona of the 16-year old she was when stricken, she at first cannot readily accept that middle-age visitor Pauline (Jane Beller) is in fact her sister, who has been coming to see her the whole time. Having escaped a collective reality that whole time while roaming her own “kind of Alaska,” as Dr. Hornby phrases it, Deborah’s awakening is a medley of mood swings, from feisty to fretful to fanciful to warily inquisitive. Reminding us that impactful acting doesn’t happen just from the neck up, when Deborah leaves bed and abruptly loses her equilibrium, the fall is so real and startling, I worried for the actress’s well-being. Predictably, she knew exactly what she was doing, and how to do it. Playing Deborah is close to a monologue, and Ms. Bessette paints the part with fine shadings and bold strokes. Ms. Beller is spot on as the dry, tart-tongued sister, who long ago married Dr. Hornby, administered by a nicely understated Mr. French. 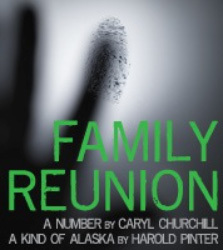 “Alaska” ’s sibling in the “Family Reunion” twin bill is a dark rumination on what ruination the science of cloning might wreak on the souls of copies and originals alike. Mr. Stevens commands the stage thrice, as two clones and the “source,” or real, offspring of Salter (Mr. French), a father seized by poor judgment who realizes too late he has replicated his regrets. His direct descendant, Bernard 1, has evolved into an evil twin from parental neglect, while his cloned half-brother, Bernard 2, is an innocent, born of a guilt-ridden father who has shielded him from family secrets. Curiously, as well as craftily, Ms. Churchill circumvents the word “clone” by using “copy,” which carries an even more dehumanizing resonance. Being copied, in fact, is what dehumanizes the first Bernard, who, as an act of vengeance against his father, visits his wrath on the second Bernard, before turning his vengeance on himself. (While the Pinter piece thematically is true to the literalness of the double-bill’s title, this half — texturally and textually — is family disunion.) In the end, an outlier copy, one of many created unwittingly by Salter when his cell was appropriated by a hospital, proves to be perhaps the most unsettling end-product of all. As Salter peppers Michael Black with a barrage of questions to divine his true temperament and inner life, this “number” (a math teacher, no less) reveals a numbingly robotic nature neither good nor bad; he’s all talk, no traction. Hard as he tries to find a common core in the far-flung offspring of his, Salter just can’t dig it. Mr. Stevens’s hat trick of limning each of Salter’s handiwork with a unique gestalt – accented by British intonations that vary just enough to be serviceable — is the kind of high-stakes, fancy footwork on stage that, like gymnastics, is tightly disciplined and fun to watch. For his part, Mr. French gets to emote more expressively than in his “Alaska” role, as he heartily evinces empathy from the audience with tender bouts of remorse, self-doubt and pride. As with the oeuvres of Pinter and Churchill en toto, these are challenging, cerebral and at times cryptic works that could bemuse theatergoers more partial to the easy pickings of broad, mass-appeal diversions. What helps make Hudson Stage a rare theatrical gem in these parts is that, in its choice of titles and talent, producers Denise Bessette, Olivia Sklar and Dan Foster – who directed Family Reunion with his usual elan and eye for theatrical grace notes — Hudson Stage knows its audience, and treats it with respect and intellectual integrity. Plus, its product always is fresh and surprising, not dog-eared pages from the same “play book” of overly familiar “classics” — in vintage, if not in vitality — so many theater companies seem to share, with a wan enthusiasm mirrored by sparse audiences. Give me daring and driven every time over safe and simple. Family Reunion plays through May 17 at Woodward Hall Theater on Pace University’s Briarcliff campus, which Pace is closing later this year in favor of expanding its Pleasantville campus. Starting this fall, future Hudson Stage Company productions can be enjoyed at one of the finest mid-size performance spaces in this region: Whippoorwill Hall Theater, part of North Castle Library in Armonk. Ticket information: hudsonstage.com; (914) 271-2811.